Optimizing your car's performance requires more than just throwing a bunch of parts under the hood. Understanding the relationship between various systems and the mathematical computations necessary to determine which parts will give you the performance you want is key to improved performance in today's factory-tuned cars. Use the info in this section to help you select the correct parts for your application. If you have any questions, give a call to our toll-free Factory Tech Line: 1-800-416-8628. Example: What MPH at 6500 RPM with a 4.9 rear axle and 14 inch radius tire in 4th (1:1) gear? Example: In 3rd gear (1.34)? Note: Tire Radius is distance, in inches, from center of wheel to the top of the tire. Note: Gear Ratio is Rear Axle ratio divided by Transmission Gear ratio. Example: Using the first example, what tire radius for 110 MPH but at 6000 RPM with a 4.11 gear? Tire Radius = 168 x 110 x 4.11 ÷ 6000 Tire Radius = 12.7 inches Note: Approximately a 25" diameter tire. Remember that the tire radius will be less during hard acceleration than when the vehicle is standing still. Also, radius will be greater at high speed due to tire expansion from centrifugal force. If VE (volumetric efficiency) is less than 1 (or 100%) the amount and quality of charge in the cylinder is reduced so less torque is produced. VE above 100% is a supercharging effect and more torque is produced. Example: What is CID of a V8 with a “30 over”, 4 inch bore and 3.48 inch stroke? A measure of air flow into and out of an engine (CFM = CID x RPM x VE ÷ 3456). Example: What CFM is consumed by a 355 CID engine at 4500 RPM if VE = 105% (1.05)? CFM = 485 Example: What CFM by the same engine at 6400 RPM if VE has fallen to 95% (0.9)? Example: What is the cubic-inch displacement of a 5000 cc engine? TO CONVERT CC'S TO C.I.D. Example: What are the cc’s of a 350 C.I.D. engine? Please Note: The above equations and rules apply only to four-cycle engines. The equations have been simplified for ease of understanding. Answers will be approximate but generally will be close enough for use as a guideline. Note: if volume is given in cc’s then ÷ 16.4 to get cubic inches. Example: What is CR of the engine in #9 if heads have 72 cc chamber, head gasket is compressed to 0.040 inch and flat top pistons give 0.025 deck clearance at TDC? Example: You have a 28 Lb/hr (@45 psi) injector. How much will it flow at 60 psi? Example: How much power can be supported by eight 28 Lb/hr injectors? Example: You have 15 in Hg (inches of Mercury) at idle. How much is this in Kpa? 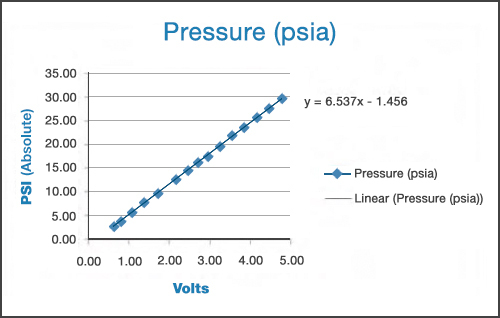 Typically flow bench values are given for a pressure drop of 28 in H2O. To convert flow figures from a different pressure drop to 28 in H2O use the formula above. Example: You have flow figures of 152 cfm at 10 in H2O. What if the same head was flowed at 28 in H2O? Brake Specific Fuel Consumption is the ratio of fuel consumed (in lbs. per hour) to horsepower produced. This ratio is a direct indicator of how efficiently the engine converts fuel into power. Most factory gasoline type engines run approximately a .50 to .55 Brake Specific Fuel consumption (BSFC) range while a highly efficient normally aspirated race engine operates at approximately a .40-.45 BSFC. These factors should be considered when sizing & selecting injectors for your particular application. Example: How much fuel flow will you need to feed your new 440 hp E-Tec EFI crate engine? Example: What is the GPH for the 440 hp crate engine? Carburetors are rated by CFM (cubic feet per minute) capacity. 4V carburetors are rated at 1.5 inches (Hg) of pressure drop (manifold vacuum) and 2V carburetors at 3 inches (Hg). Rule: For maximum performance, select a carburetor that is rated higher than the engine CFM requirement. Use 110% to 130% higher on single-plane manifolds. Example: If the engine needs 590 CFM, select a carburetor rated in the range of 650 to 770 CFM for a single-plane manifold. A 750 would be right. An 850 probably would cause driveability problems at lower RPM. A 1050 probably would cause actual loss of HP below 4500 RPM. For dual-plane manifolds use 120% to 150% higher. Manifolds must be sized to match the application. Because manifolds are made for specific engines, select manifolds based on the RPM range. With the proper carburetor and manifold it is possible to select a cam that loses 5% to 15% of the potential HP. These losses come from the wrong lift and duration which try to create air flow that does not match the air flow characteristics of the carburetor, manifold, head and exhaust so volumetric efficiency is reduced. An increase in camshaft lobe duration of 10 degrees will move the HP peak up 500 RPM but watch out; it may lose too much HP at lower RPM. Cylinder heads are usually the limiting component in the whole air flow chain. That is why installing only a large carburetor or a long cam in a stock engine does not work. When it is not possible to replace the cylinder heads because of cost, a better matching carburetor, manifold, cam and exhaust can increase HP of most stock engines by 10 to 15 points. To break 100% Volumetric Efficiency, however, better cylinder heads or OEM “HO” level engines are usually needed. An engine must exhaust burned gases before it can intake the next fresh charge. Cast iron, log style manifolds hamper the exhaust process. Tube style exhaust systems are preferred. But headers are often too big; especially for Performer and Performer RPM levels. Improving an engine’s Volumetric Efficiency depends on high exhaust gas velocity to scavenge the cylinder. This will not happen if the exhaust valve dumps into a big header pipe. On the newer computer controlled vehicles it is also important to ensure that all emissions control devices, and especially the O2 sensor, still work as intended. Spark timing must be matched to Volumetric Efficiency because VE indicates the quantity of charge in each cylinder on each stroke of the engine. Different engine families require distinctly different spark advance profiles. And even engines of equal CID but different CR require their own unique spark advance profiles. Rule: Expect 0.1% to 0.5% loss in Torque for each 1 degree error in spark timing advanced or retarded from best timing. Also, detonation will occur with spark advanced only 3 degrees to 5 degrees over best timing and detonation will cause 1% to 10% torque loss, immediately, and engine damage if allowed to persist. 1. The TMAP sensor mounted on top of the manifold at the rear of the driver's side, outputs a 0-5 volt signal through pins 1 & 2 (pin 1 is signal & pin 2 is signal return,) that can be converted to an absolute pressure reading using the below calibration curve. Use of this signal requires an ambient pressure correction for calculating boost pressure. 2. The second option is to utilize the pressure port at the rear of the passenger side intake runner flange. Your supercharger has been pre-drilled and tapped for a 1/8" NPT fitting. There is currently a plug sealing the hole, which can be removed, and replaced with a fitting to adapt to your sensor. CAUTION: Never cut into the vacuum lines leading to the fuel rail pressure sensor and bypass actuator, on the driver's side of the manifold, for the purpose of tapping in a boost gauge. Interruption of the vacuum signal to the fuel rail pressure sensor can affect the fuel pressure reading to the PCM, which can result in engine failure! Furthermore, this port reads pressure before the intercooler, and therefore is before the inherent intercooler pressure drop. Readings from this port will always be approx. 20% higher then what the engine actually sees. If measured properly on an otherwise stock 4.6L Mustang GT, your boost readings, utilizing an electronic transducer or MAP sensor, on a dyno, should be comparable to this boost curve, shown below, collected from a recent dyno test here at Edelbrock. If you install a mechanical boost gauge in your vehicle, you will see a steady 5 PSI on the gauge during full throttle acceleration on the street. If you are using a custom calibration for your GM based E-Force application you will need the following TMAP information in order for the Manifold Absolute Pressure and Intake Air Temperature parameters to read correctly. To help determine which sensor you have you can look at the serial number. If your superchargers serial number is between 1 and 1611 your system will have the Ford TMAP, unless you have a Z06, all Z06 applications use the Bosch TMAP regardless of what the serial number is. The Ford TMAP will be attached to the supercharger housing with 2 bolts. If your superchargers serial number is 1612 or greater your system will have the Bosch TMAP. The Bosch TMAP will be attached to the supercharger housing with 1 bolt. NOTE: If you have a 2005 LS2 the offset cannot be below 0, so just use 0 and it will be fairly close. NOTE: If you have a 2005 LS2 it will limit the Linear to 255.9 and the offset can't be below 0 so just use those values and it will be fairly close. NOTE: The stock IAT values should be fairly close, if they are not you can use the values below. In addition, area being equal, a single bore will always flow better than a twin bore because there is less bounding surface area to interrupt the flow. Also, both the stock GT throttle body and the GT500 throttle body have an as cast surface leading into the bores, where the Edelbrock unit is machined through for less wall friction. Last, the inlet is port matched to the throttle body for a perfect matching transition.